▲ Representatives from each major are participating in the meeting. On June 7th, the representatives from ten majors in the College of the Social Science participated in the whole student representatives’ meeting and shared their opinions in Cho-heo-dang seminar room, from 6:30 P.M. to 9:30 P.M.
First, executive department of the College of the Social Science checked the number of the participants and Lee Jae-min, the chairperson of the college announced the beginning of the meeting. Then the participants elected two clerks and shared the detailed rules for the meeting. After that, items and sequence of the meeting were accepted and the main session was started. Subsequently, four items were reported by the executive department. They informed about what they have done in the first half, and how campaign pledges were fulfilled. 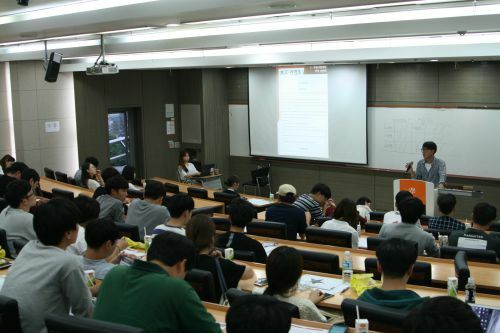 Then Park Boo-yeon, the chairperson of the delegate in the college, reported the result of inspection regarding an orientation for freshmen, and said, “Next time, we will try to be more meticulous and systematic to increase the students’ trust.” Then Chairperson Lee explained about the detailed rules regarding financial affairs and answered the questions from the representatives from each major. In the next part of the meeting, the participants shared their opinions about the situation regarding President Han Tae-sik (Bogwang). Participants pointed out that students’ participation has decreased due to the lack of interest about the situation and the fear of the school. In addition, they agreed: students should be given opportunities to feel directly involved in the movement regarding the situation because it is meaningful by itself as a means of displaying students’ demand.